One year on from the signing of the Good Friday Peace Agreement, nothing has changed for the nationalist working class. As An Phoblacht, the paper of Sinn Fein, clearly put it: "While IRA guns have been silent, the nationalist people have continued to face assassination, bomb attacks, church burnings, lynch mobs and attacks on their homes". BOB SHEPHERD reports on a year of violence which belies the talk of peace. The process of the Peace Agreement remains deadlocked as Trimble and the Ulster Unionists repeat their demand for IRA arms decommissioning as a precondition for sitting in an executive with Sinn Fein ministers. Deadlines set for April came and went, with Blair now setting 30 June as the absolute deadline for reaching agreement on the setting up of the "Assembly Executive". What happens if this deadline isn't met wasn't made clear, but one thing we can be sure of is that loyalist attacks and intimidation of the nationalist community will continue. 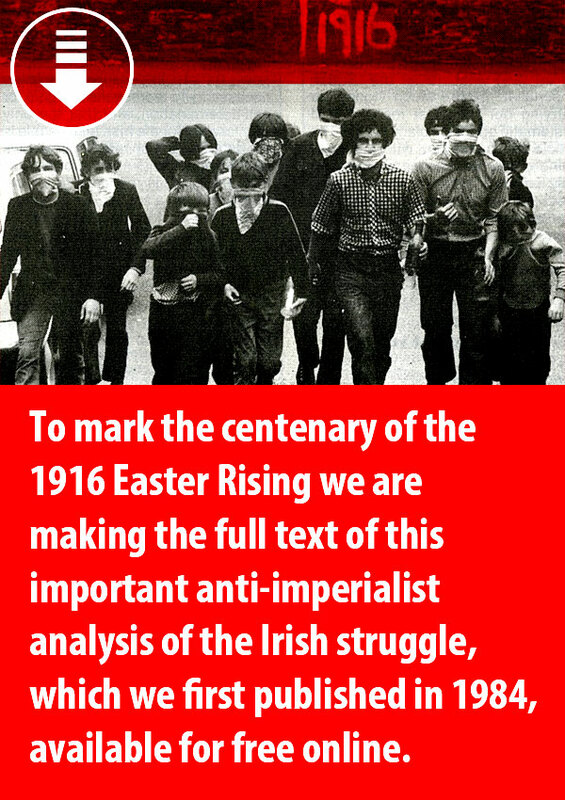 The 8 April issue of An Phoblacht had a full page covering "A year of loyalist attacks" from March 1998 to March 1999. The attacks reported ranged from murder to petrol-bomb attacks to families forced out of their homes. Examples include the following. April 12-year-old attacked by loyalist mob, Crumlin Road, Belfast. 21-year-old beaten unconscious by loyalist gang, Finaghy, Belfast. May Pearl Segar of the Women's Coalition intimidated out of her East Belfast home. Catholic schoolboy attacked, Antrim Road, Belfast. Attack on Catholic home, Stoneypath, Derry. Attacks on Catholic homes in Portadown. Loyalist mob attacks homes, Whitwell area, North Belfast. July In one 48-hour period, 73 Catholic homes and 71 businesses attacked, 136 cars hijacked, 213 cars damaged. Catholic churches and schools attacked in North Belfast. The three Quinn children brutally murdered in a pipe-bomb attack on a mixed' estate in Ballymoney. 144 other Catholic homes in predominately Protestant estates suffered fire bomb attacks. 155 other Catholic-owned premises damaged. 14 homes in Carrickfergus petrol-bombed. Two homes in Greenisland and five in Antrim petrol-bombed. Catholic homes in Larne attacked. Integrated school and Catholic primary school attacked in County Antrim. A pub and two businesses fire-bombed in Kilkeel. Mass-goers fired on by loyalist gunmen. Bushmills, County Antrim. Protestant family driven out by loyalist mob, Eastvale estate, Dungiven. September Loyalists picket Aghadrumsee primary school, Fermanagh, to prevent two newly-appointed Catholic cooks from taking up their positions. October Homes attacked in Serpentine Road and Whitewell Road, North Belfast. Brian Service shot dead, North Belfast. January Bomb attack at building site, Magherafelt, South Derry. Petrol bomb attack, Waterside. Eleven families forced out of their homes in Garvaghy Road area, Portadown. Pipe-bomb attack on group of mass-goers, Antrim. 16 families intimidated out of one estate in Antrim. February 250 loyalists gather at the end of Garvaghy Road and attack local residents. The attacks and intimidation of the nationalist community have escalated as the Peace Agreement has deadlocked. On 9 April the "Orange Volunteers" launched a pipe-bomb attack on a bar in County Antrim, injuring a customer. In the same week a couple living on the Steeples estate, Antrim, had their cars destroyed because they are in a "mixed" relationship. On 14 April two Catholic homes in Randalstown, County Antrim, had pipe bombs pushed through their letter boxes. On 19 April a Catholic home in Serpentine Park, North Belfast, was attacked with a pipe bomb. Sinn Fein said the attack "was part of the loyalist campaign to drive Catholics out of that area'. On Monday 26 April a gang of up to 30 loyalists rampaged through the Parkside area of North Belfast. Armed with sticks they attacked residents and hurled bricks and petrol bombs at houses. On 6 May loyalist gunmen opened fire on two 12-year-old boys in Ardoyne, North Belfast. It was only because the gun jammed that the boys survived, it didn't stop the gunmen firing five shots as the boys escaped into a nearby betting shop. It has come to light that over 100 people in the Ardoyne area have been informed by the RUC that their details are in the hands of loyalist death squads and their lives are in danger. The RUC conveniently refuse to say how these details passed into the hands of the loyalists or who told them! On 12 May a Catholic worker was shot in the legs and chest by a loyalist gunman as he went to work in Carrickfergus, County Antrim. Official figures given by the British government reveal that between 1 May and 31 December last year, 1,358 families sought rehousing due to intimidation. This eight-month period begins with the start of the marching season, at the beginning of the period of the new "Peace Agreement". The overwhelming number of families seeking rehousing are nationalists. The events around the Drumcree stand-off forced large numbers of nationalist families to move. Within a few days of the sectarian murder of the Quinn children, 36 other families had applied to move from the same estate. At the time of the murders, five other Catholic families had already received death threats. This is the reality of life for the nationalist working class in the north of Ireland today. The Peace Agreement hasn't improved conditions, and in some respects has made them worse. Sinn Fein's commitment to the peace process and the ceasefire of the IRA have left nationalist communities vulnerable to the attacks of fascist loyalist terror gangs. Underlying the increase in sectarian attacks is a deteriorating economy. A report produced by accountants Price Waterhouse Coopers showed that economic growth in 1998 was half the rate of 1997, 1.9%, whilst the rate of redundancies rose by 31%. It states that "the threat of recession hangs over a substantial percentage of Northern Ireland industry". The report also points out that more people are employed at Heathrow airport than in the whole of manufacturing in the north of Ireland! Whatever the outcome of the 30 June deadline, the pressure from the nationalist working class on Sinn Fein and the Republican movement to defend their communities will increase.